In the last few decades, we have seen technology transforming every sector. Innovations are changing how we see the world and are aimed towards making our lives better and easier. Virtual Reality (VR) and Augmented Reality (AR) have been able to use technology in a way that it gives the user a unique experience. Virtual Reality does this by completely altering your situation and creating a new environment whereas Augmented Reality uses your current environment and adds an extra layer of interaction to it. After making its mark in the gaming industry, this technology is being used by businesses in their marketing efforts as well. If you are thinking of ways to make a great impact in your next trade show, you should consider using AR/VR in your marketing efforts. In this article, we will discuss some of the ways you can use AR/VR on your next trade show. When planning to use augmented reality in your trade show exhibit, you have many ways to incorporate this technology to give the audience a memorable experience. As Augmented Reality can also be used by the audience on their phones, it is a good idea to create something that people can take home with them. This will give them an opportunity to share the experience with others which will increase word of mouth advertising of your brand. Virtual Reality is being used on a more frequent basis by companies to make their customers feel like they are purchasing an experience and not just a product. Additionally, by using virtual reality at your tradeshow, you can be sure of gaining attention by the audience. This is because people are always looking for something that is interactive and that does not require them to look at someone talking about the great benefits of the products. Using Virtual Reality largely depends on the kind of product or service you are trying to sell. If it is a product that is being sold, it is a good idea to use Virtual Reality to tell the audience about different product attributes features and functions. You can also use Augmented Reality for this purpose by creating an addition to their current environment that talks about the product to them. However, if the product is relatively simpler and does not have a long list of features and attributes that need an explanation you can use AR/VR to give information about the background of the product. This can be done by, for example, telling the users how the product is made and showing them the whole process. By witnessing this process and experiencing it, the users are sure to have a unique experience tied to this product which can greatly affect the sales of the product. You can also use AR/VR in the marketing of your product by making the users experience what it feels to use the product or service that you are offering. 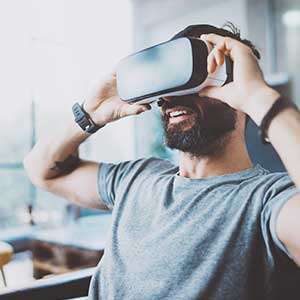 For products that are relatively new in the market and have distinct features, you can use AR/VR in a way that it helps the audience experiencing the use of the product. This technique is also excellent for sellers who are looking to sell products that are relatively bigger and cannot be easily brought to a trade show. By using AR/VR, the sellers can easily let their audience have the experience of using the product and achieve their objectives. If the audience succeeds in having a unique experience, the sellers will benefit from this marketing technique without having to go through the hassle of introducing their product in the tradeshow. When selling a service or experience, AR/VR platform is an ideal choice to grab attention at your tradeshow booth. By using AR/VR experience, you can make the users get a feel for the experience that you are selling. Selling a service or experience is considered to be relatively difficult unless the potential consumers can see and feel what your service entails. In addition to all these benefits mentioned above, using AR/VR in your tradeshow can help you establish yourself as a brand that is technologically advanced and brings ease to their consumers.